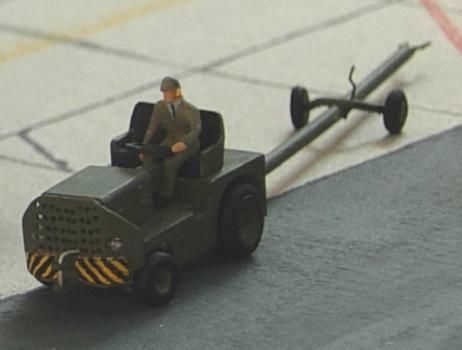 To provide some scale reference to the often tiny 1/144 scale aircraft I've made a 1/144 scale tow tractor. The little tractor and its tow bar are scratch built, the tractor was scaled down from the tug in the old 1/72 Revell Germany F-16A kits. The tractor is 21mm long, the tow bar is 50mm long. To make the model as versatile as possible I made the front wheels steer and fitted separate locking pins to the front and rear tow clamps, so different loads can be attached. The driver on the tug was converted from a Preiser N-gauge firemen set (kit nr.9005) and painted as NATO ground crew. The holes in the radiator shroud are not that well aligned, it proved quite difficult to drill 45 equally spaced holes in an area measuring only 4 by 5mm !